SKU: vp07. Category: Virtual Pinball Parts. THese are the same as the “old school” tilt bobs used primarily in pinball machines. 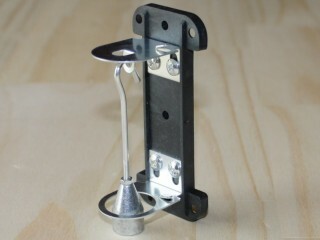 They rely simply on the swinging bob making contact with the lower ring to close a circuit, which can then be used to send a signal to your software to tell the game to tilt. Used in conjunction with the nudge function in our Pinball Encoder, this can help prevent your more “enthusiastic” friends from being too heavy handed when playing your Virtual Pinball machine! It also provides a more realistic tilt event – rather than setting the software to tilt when a certain force is detected, the bob swings around so it’s more a combination of hard nudges that will cause it to make contact and cause a tilt. The assembly is adjustable in a number of ways to ensure you can set it up for the desired sensitivity and is then wired up to the appropriate input on the encoder in your cabinet.